The first episode of new SBS’s Monday and Tuesday drama series, “A Thousand Days’ Promise,” was getting viewership rating of 12.8% on national average and 14.7% on capital average for its premiere first episode aired on October 17, 2011, a brilliant achievement. The double-digit rating is 2.7% more than rating of first episode of its predecessor “Warrior Baek Dong Soo” which was rated 10.1%. 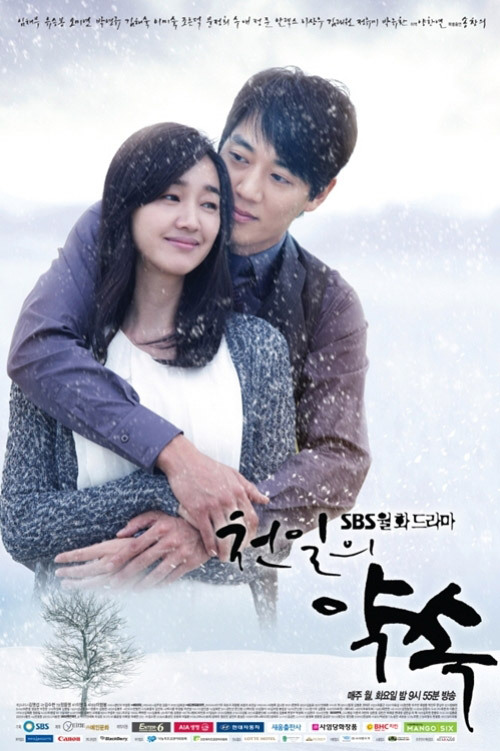 In the first episode, the passionate romantic scenes between Kim Rae Won and Soo Ae has been attracting everyone’s eye. The first episode tells the story of Park Ji Hyung (Kim Rae Won) who is about to marry Noh Hyang Gi (Jung Yumi). He has been secretly seeing Lee Seo Yeon (Soo Ae). But when the parents of both sides set the wedding date, Ji Hyung, seeing painful Seo Yeon, has a showdown with his mother: “I have another woman”, and the story begins to become tense. Meanwhile, MBC’s “Gyebaek” is rated 13.5% and KBS2’s “Poseidon” is rated 7.9%.